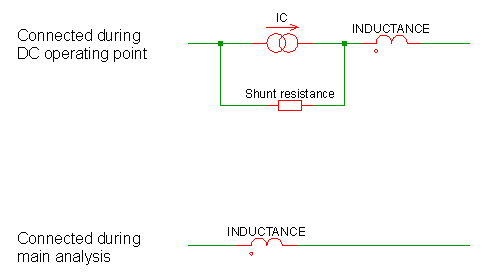 Initial conditions may be applied to capacitors and inductors and may also be applied to a single node using the .IC statement. Initial conditions force a voltage or current to be applied during the DC operating point analysis. Here we describe the various methods to apply an initial condition. The above sets the resistance to 1m???MATH???\Omega???MATH???. Note that an initial condition may also be applied to a node or across a pair of nodes using a capacitor with a value of zero. See next section. The different configurations have come about because of a need for compatibility with other simulators, namely SIMPLIS, Berkeley SPICE and PSpice. NO 1 X Initial condition=0V, driving resistance=0???MATH???\Omega???MATH??? YES 0 1 SIMPLIS compatible. YES 0 2 PSpice compatible. YES 1 X SIMPLIS compatible. Note that for full PSpice compatibility, the ICRES option should be set to 1m. Alternatively the option setting PSPICECOMPATIBILITY=1 or PSPICECOMPATIBILITY=2 may be set which sets ICRES to 1m and INITCONDMODE to 2. NO 0 X Initial condition=0A, shunt resistance=???MATH???\infty???MATH??? YES 1 1 SIMPLIS compatible. YES 1 2 PSpice compatible. Initial condition=IC, shunt resistance=1e9 ???MATH???\Omega???MATH??? YES 0 X SIMPLIS compatible.